Sunday, February 10th, 2019, 4- 6 pm, 1412 W Alabama St, Houston, TX 77006. 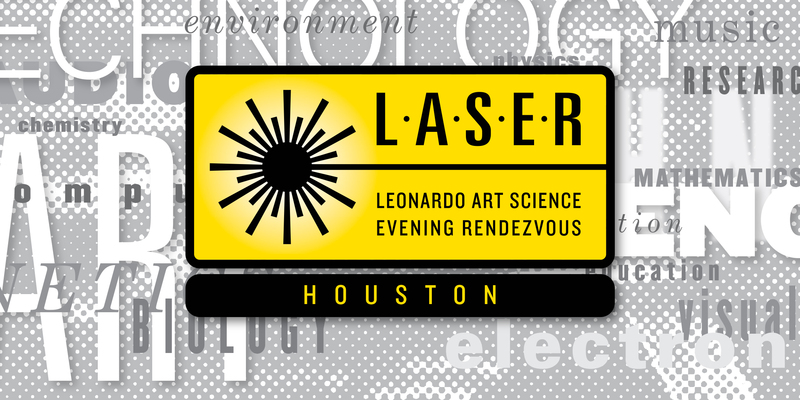 Houston welcomes LASER (Leonardo Art Science Evening Rendezvous) the Leonardo/ISAST's international program of evening gatherings that bring artists and scientists together for informal presentations and conversation with an audience. LASER Talks were founded in 2008 by Bay Area LASER Chair Piero Scaruffi and are in over 30 cities around the world. Leonardo/The International Society for the Arts, Sciences, and Technology (Leonardo/ISAST) is a nonprofit organization that serves the global network of distinguished scholars, artists, scientists, researchers and thinkers through our programs focused on interdisciplinary work, creative output and innovation. From its beginnings, Leonardo/ISAST has served as THE virtual community for purposes of networking, resource-sharing, best practices, research and events in Art/Science/Technology. As part of the LASER international talks, our aim to illuminate the extraordinary interdisciplinary research and applied practice taking place across Houston in our laboratories, art studios, and classrooms. Our intention in bringing LASER to Houston is bridging the art and science practices that have independently brought international recognition to the city and are unique to Houston’s identity. With this event, we will bring these communities together, expanding the art and science network, fostering creative dialogues and future collaborations. Dr. Zahner's basic research has focused on medical devices and resulted in hardware development, grants, and patents in the fields of balance, acoustics, sample processing, and microbial growth, along with prototype hardware in sample tracking and hand hygiene. His clinical research is focused on diagnostic error using the diagnostic management team and mobile app development. Prior to medical school, he was a mechanical engineer for the National Aeronautics and Space Administration (NASA) for the International Space Station (ISS) specializing in Environmental Control and Life Support (ECLS) systems and was the lead engineer for the Waste and Hygiene Compartment (WHC). He received a Mechanical Engineering MS from the University of Florida in 2005, an MD from Texas Tech Health Sciences Center in 2015 with a CP in Pathology from University of Texas Medical Branch in 2018, where he is currently Assistant Professor. After brief look back at historical precedents, Johannes Birringer introduces concepts of the material affects of choreosonic wearables, discussing the design of wearables used in immersive performative environments – here called “kinetic atmospheres” (kimospheres) – which are conceived as formative, not built or constructed in a stable form but responsive to movers, wearables or, even, are wearable themselves. Basing its exploration of such interactive environments for wearable performance in recent installations of the DAP-Lab, the talk sketches ideas for extended choreography and role-play within such kimospheres, also delving into more speculative developments of how bodies and wearables come to affect, and be affected by, kinetic, sonic and VR interfaces – in the sense in which the composer Xenakis had envisioned reverberant multimedia architectures and spatial intensities to be live instruments, not static objects or envelopes. Johannes Birringer is an independent choreographer/media artist. He began directing dance-theatre in the mid-1980s while finishing his PhD at Yale University, and then moved to Houston to work in the independent visual art/performance scenes. After the fall of the Berlin Wall and moving to Chicago in 1990, he developed video and performance projects that involved interactions with other artists and cultural workers in Havana (Cuba), Ljubljana (Slovenia), Dresden (East Germany), and Brasilia (Brazil), while also directing workshops on dance-technology both locally and internationally. Since 1993 he has been artistic director of AlienNation Co (www.aliennationcompany.com), and created numerous dance-theatre works, videos, digital media installations and site-specific performances in collaboration with artists in Europe, the Americas, China, Japan and Australia. His film “La Lógica que se cumple” premiered at the Havana Film Festival (1996), and at the Chicago Latino Film Festival (1997); dance videos were shown at the Dance Screen Festivals (IMZ) in 1994, 1995 and 1996. After moving back to Houston, he worked as an independent choreographer and as curator of Winter Street Art Center. In 1999 he was invited to build a new dance-technology program in the Department of Dance at Ohio State University, where he then taught the annual experimental laboratory "Environments" from 1999-2003. His film installation “Vespucci” toured Brazil in 2001; a dance film, “XU”, was created and exhibited in Beijing in 2004, and “Canções dos olhos / Augenlieder“ was featured at SARC, Belfast and the 2007 Dança em Foco in Rio de Janeiro, Brazil. The collaborative telematic installation “East by West“ was shown at DEAF2003, Rotterdam. He lives in Houston and London, and co-directs the Design and Performance Lab at Brunel University London, where he is a professor of performance technologies (www.brunel.ac.uk/dap). Together with fashion designer Michèle Danjoux he has created immersive dance works featuring electro-acoustic and sensortized wearables. DAP-Lab’s “Suna no Onna“ premiered in London in 2007; the mixed reality installation “UKIYO [Moveable Worlds]“ premiered in 2009-10 before touring in Eastern Europe in 2010. A dance opera, “for the time being/Victory over the Sun,“ premiered first at Watermans International Digital Arts Festival in 2012, an expanded version at Sadler’s Wells (2014). He collaborated on the European METABODY project and developed kimospheres, a series of immersive installations that began touring in 2015-18. He is also founding director of Interaktionslabor (http://interaktionslabor.de) and released a manifesto on interactive art in 2014 (http://interaktionslabor.de/manifesto.htm). He has written many articles for some of the leading international performance and media arts journals, and is author of numerous books on performance and media, including Theatre, Theory, Postmodernism (1989), Media and Performance (1998), Performance on the Edge (2000), and Performance, Technology, and Science (2009). He has spearheaded new transdisciplinary dance- research projects, including the books Dance and Cognition (2005), Dance and Choreomania (2011), and Tanz der Dinge/Things that dance (2019). Kate Kerr by day is a Speech Language Pathologist who has over 25 years on healthcare services. She received her Bachelors from the University of Wisconsin Eau Claire and Master's Degree from the University of Wisconsin- Oshkosh. Her work has taken her all along the coast from California to Florida and now to Galveston Texas. She has a passion for speech pathology and bringing innovation to her field. By night, Kate Kerr is an entrepreneur and ghost hunter. She is venturing into a new business in Galveston called The Galveston Experience Company which will showcase her ghost hunting adventures. Kate's mind is always busy thinking about what can be done next and she is here to tell you how she does it all. This talk will focus on bringing ideas into action. Whether they are large scale ideas or small. During this talk, you will hear how Kate Kerr has taken ideas in the world of speech pathology and in the entertainment industry and is working to turn those ideas into reality.